The UFC rolls into Wichita, Kansas of all places for Fight Night 146! The highlight will be the Black Beast, Derrick Lewis looking to knock out Heavyweight veteran, Junior Dos Santos. Here are the Palmerbet Teams tips & preview for UFC Fight Night 146. Analysis: There is barely a fighter in the UFC that is more hyped and worth watching than Derrick Lewis. Basically a modern day Kimbo Slice, the big man from the US is the leading knock out machine in the world. His hulking right hand has put more people to sleep than warm milk. Currently the #2 ranked Heavyweight in the UFC, his submission loss to superstar Daniel Cormier one of the rare blips on his career. He’s not the fastest worker in the business, has no submission game, but just needs one moment and it could be lights out for Dos Santos. 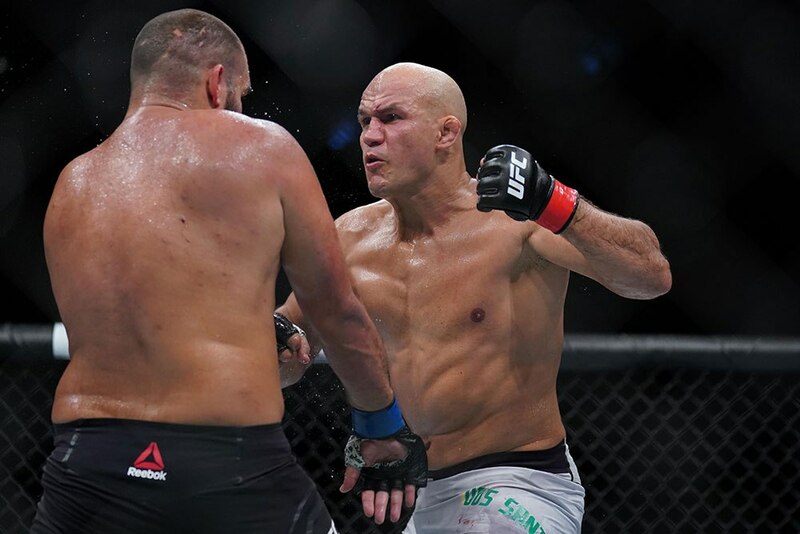 Junior Dos Santos is a name familiar to many after his storied history with Stipe Miocic and he’s looking to improve his #7 ranking in this one. Typically you expect Brazilian UFC guns to be submission masters, but Dos Santos is all about the fists. One of the best in the business at striking from distance, his game is perfectly suited to stuffing Lewis in the takedown. That distance strategy and in and out movement will be a real headache for Lewis who relies on a close chin or ground and pound. Unsurprisingly Dos Santos is the fancy here given the way he matches up to Lewis’ one trick show, but Lewis is too big, too vicious and just needs one opportunity at great odds. Analysis: A tasty Welterweight bout with both fighters in delicate places in their careers. Tim Means was almost out of the UFC door, till a dominant performance in Season 28 of The Ultimate Fighter has given him redemption and a shot at Finishing Machine, Niko Price. Means works the ring but does lack a clear weapon so he’ll need to stay mobile AND on his feet. Both fighters are evenly matched but the market is favouring Means. Surprising given his lack of weaponry and at reasonable odds, we think Price will go to his submission game. Analysis: Is there anything more entertaining that 515 pounds of exhausted men swinging wildly late in a fight desperate to not leave it in the hands of the judges? The answer is no and this one looks to be another. Ivanov is a former champion in the World Series of Fighting, floated thru Bellator and now has a second shot to cement his UFC place. His game is incredibly versatile for such a big man and his tank is outstanding. He presents series danger for the stand and bang game of Rothwell. Rothwell has been in the UFC for ten years but last fought in 2016 against Dos Santos. A two year suspension for a testosterone anomaly has derailed his career, but now the ban is up, he’ll be looking to get back in a big way. He’s fought and beaten some big names such as Schaub, Overeem and is all about knocking other big men into next week. HIs weakness will be conditioning, lack of quality competition and takedown defence. Analysis: Iranian Southpaw, Dariush takes on Drew Dober in a “staying relevant” Lightweight bout. Dariush is yet to make his mark in the division and needs a series of consecutive wins to climb into the top 10 rankings. He enjoyed his first win since 2016 against Brazilian Thiago Moises but needs to up his power game against a resolute fighter in Dober. A strong submission game is likely to see the Iranian take this one to the ground. Drew Dober is on the up with three wins on the trot, but is in one of the most stacked weight classes in the UFC. Competing in the same division as Khabib, McGregor, Diaz, and many more, he’ll need to do something special to get a chance to do something special. And therein lies the rub. He’s a talented fighter but lacks a dominant skill. With just two KO’s from his last 20 fights, his lack of finishing power sees a large amount of his fights go the distance. We’re not expecting this one to be one for the highlight reels and expect it to go to the judges. Analysis: Grant Dawson is welcomed to the UFC on an 11 professional fight run that has never gone the distance. Dawson is basically a choke specialist and one of the slipperiest at that. With just a single loss, he’s certainly an exciting prospect. Questions remain on his conditioning and the step in class to the UFC, but he goes in a firm favourite. Erosa enters the bout with experience, height and reach on his side. His ability to eat a punch allows him to work in close, opening up a strong KO and Submission game. Like Dawson, Erosa’s tank is suspect and in his last bout, he was knocked into the next postcode by Devonte Smith’s incredible speed but his own KO game has really stepped up. Erosa looked outclassed in his last match up and well out conditioned. Dawson’s impact should be felt here.